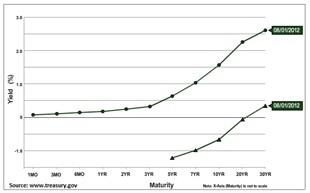 Analysis Of US Bond Markets | Business Article | MBA Skool-Study.Learn.Share. The prices in the bond markets move in an inverse direction to that of the yield expectation of the market participants. In the recent past, the yields on the US treasury bonds have fallen to historic lows and the prices have rose to historic highs. We would like to highlight a few aspects which have impacted the US bond markets in the last four years and our expectations of those effects in the future. The fed funds rate is the rate that banks charge each other to lend overnight. Banks in the US have to maintain a daily overnight reserve balance with the US Federal Reserve. Banks facing a shortfall in their reserve balance borrow overnight from banks that have a surplus in their reserve balance without any collateral. The weighted average rate of all such transactions is called the fed funds effective rate. The Federal Reserve sets a target rate for this effective funds rate, which serves as the cap rate for all these transactions. The Fed controls the rate using open market operations. If the Fed wants to bring the effective rate down, it will buy government securities from a bank and in return, increases that bank's reserves. With more surpluses available with banks, supply of funds for lending will increase and the effective rate will come down. To bring the effective funds rate up, the Fed will do the reverse. During the economic slowdown, the Federal Reserve lowered its target rate from 5.25% to 0.25% between September 2007 and December 2008. The rates are not expected to rise until late 2014. The Fed funds and treasury bills are competing investments. 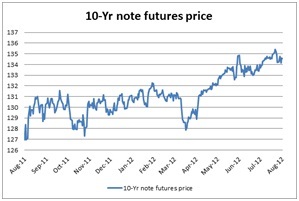 Hence, The Fed funds rate influences the yields on T-bills. The yields on T-bills are also influenced by the open market operations of the Federal Reserve because of the supply-demand equilibrium. T-notes and T-bonds are not impacted much by the Fed Funds rate because of their long-term nature. The yield on the treasury securities is determined by the prices of these securities. The prices of short-term securities are determined by the supply-demand equilibrium of the available funds. Long-term bonds are affected by supply-demand coupled with market sentiments. Corporate bond yields are usually determined by applying a risk-adjusted spread on an equivalent treasury bond yield. In 2011, the US bond markets gave good returns to investors because of the falling yields and rising prices. The return on the Barclays Aggregate Bond index fund for 2011 was 4.55%. However, the market is not expected to generate this return in 2012 as the yields are already at historical lows. The annualized return for 2012 till date is 1.8%. The main driving factor for the fall in the yields is "flight to safety" within the global economy. During the financial crisis in the US in 2007 and the subsequent debt crisis in the Europe, funds were pulled out of other markets and flew into the treasury securities of "safe-haven" like the US, Germany, Switzerland, etc. This has fuelled a rise in US bond prices and a fall in yields. The yield curve is normal in nature i.e. short-term yields are low and increase with maturity. As can be seen from the curve of real and nominal treasury yields (graph 2), the real yield is negative as of today, while the nominal yield curve ranges from 0.07% (1M) to 2.60% (30Y). The long-term treasury yields are expected to remain at the current low levels over the coming months mainly because of the rising demand for the "safe" US debt securities. There is a rising uncertainty over the European debt crisis and the investor confidence on emerging markets such as India, China, etc is weak. This will lead to flow of funds from the rest of the world into the long-term treasury securities and highly rated corporate bonds, causing the prices to remain high and yields to remain low in the coming months. 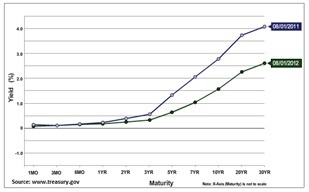 The Federal Reserveran a maturity extension program of $400 billion from September 2011 to June 2012. In this program, the Fed sold short-term securities and bought long-term securities. This led to the fall in the long-term yields (30Y) from 3.89% (Aug 3, 2011) to 2.60% (Aug 1, 2012), while the short-term yields (1M) rose from 0.01% to 0.06% during the same period. As a result we see a flattening of the yield curve over this period (graph 3). Inflation rate is also coming down and is at 1.7%. This has brought down the yield for long-term bonds. The Federal Reserve is running another extension program through2012called "Operation twist". The Fed aims to sell $267 billion worth of short-term securities and buy the same amount of longer-term securities by the end of 2012. This will lead to a further flattening of the US treasury yield curve - long-term yields may fall further. This will bring down the borrowing cost for corporate and mortgage borrowers and hence, aims to stimulate the economy. The Federal Reserve is debating whether to infuse another round of quantitative easing (QE3). During quantitative easing, the Fed prints dollars and uses those dollars to buy long-term securities from the market, causing a rise in the prices and a fall in the yields. This is aimed towards stimulating the economy by making lending and borrowing cheaper. The US markets had a temporary boost after the QE1 and QE2 programs. However, the results were not sustainable and did not stimulate the economy as expected. For e.g. during QE1, the S&P index increased by 37.9% between November 2008 and March 2010 while the real GDP growth was -3.5% in 2009. A lot would depend on the upcoming presidential elections in the US and the current European debt crisis. In the past, favourable policies have been passed before elections. However, the recent Federal Reserve Transparency Act, 2012 will call for an audit of the Federal Reserve's books, if it goes ahead with QE3. The Federal Reserve will be very conservative while taking any action and may use QE3 as a last resort if the US economy goes into a recession again or the Euro debt crisis worsens. In July 2012, the UK central bank initiated a program called "Funding for lending" aimed at boosting the amount of funds available for lending to bank customers. The central bank lends securities to other banks, which are then used by these banks to borrow funds at a low rate of 0.25%. These funds would be lent only to households and small companies. Many economists are of the opinion that a similar program would be worth consideration for the US Federal Reserve to boost the lending activity in the US economy. However, after the operation twist, the Federal Reserve may not hold enough short-term securities in its books to initiate this program. Again, we believe the Federal Reserve will wait and watch. The US had a federal debt of $14.8 trillion as of 2011 and the Federal Reserve is trying to pass a bill to increase the cap on this debt. The federal debt is expected to rise up to $20trillion by 2017. With this increase, the credit rating agencies may downgrade the outlook/rating of the US government. The risk associated with the US treasury securities and other US corporate debt securities may rise after 2013 and the yields may also rise. This article has been authored by Nikhil H. Katira and Rishi Shah from SP Jain School of Global Management. 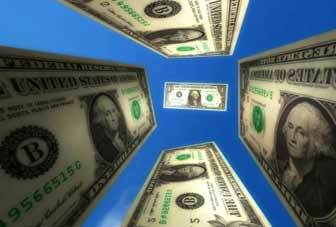 Quantitative Easing - A Blessing or a Curse?